How to add item identifiers to an item. Item identifiers are an optional way to add information to an item for tracking purposes. 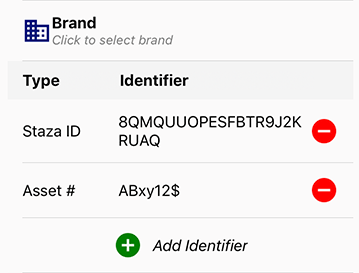 Common examples of identifiers may include Staza ID barcodes, asset tags, UPCs and serial numbers. Staza ID barcodes have been pre-configured with the app, elminating step required during the scanning process. The barcode reader will open. Scan your barcode. 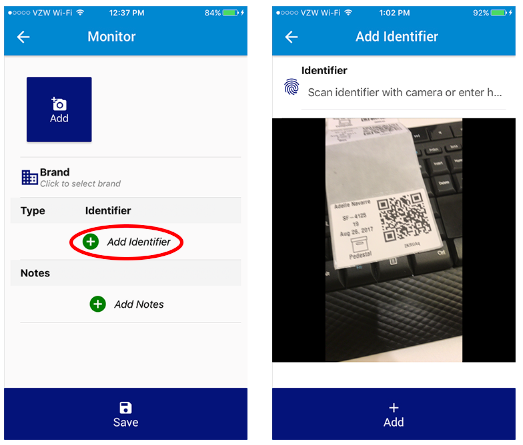 Once the barcode has been read, the screen will display the identifier found, if it is correct, click the "Add" button at the bottom of the screen. A menu of available identifier types is displayed. Select the appropriate identifier type.